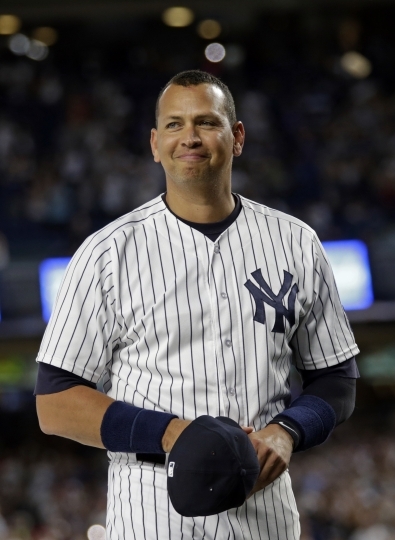 NEW YORK — His tribute ended by a storm, Alex Rodriguez began his final game with the New York Yankees by hitting a run-scoring double in the first inning Friday night. Rodriguez drove a 96 mph fastball from Tampa Bay's Chris Archer into the right-center field gap, scoring Brett Gardner from first base and ending an 0-for-11 slide. The 41-year-old Rodriguez clapped as he came out of the batter's box and pumped both arms in triumph as he reached second base without a throw. Skies darkened just as his pregame ceremony began at Yankee Stadium. With Rodriguez's family on the field, public address announcer Paul Olden said: "Alex, you spent 12 of your 22 seasons with the Yankees" when a loud thunder crack shook the ballpark, as if ordered by a film director. Rain started to fall during a video message from Lou Piniella, Rodriguez's first big league manager, and the festivities ended awkwardly after 10 minutes when a downpour began. Ten minutes later, the clouds started to clear, somewhat symbolic of A-Rod's time in New York, and a rainbow came out shortly before the first pitch. With the Bleacher Creatures chanting his name in the first inning during their roll call and the rest of the fans joining in, Rodriguez raised his cap toward them from the dugout. Fans gave him a 30-second ovation when he walked up to the plate in the bottom half. Rodriguez had slept late, ate his egg whites, stretched and took one final trip to the ballpark Stadium as a New York player. "The last time I drive up Broadway and through Harlem and through the neighborhoods that have brought so much comfort to me," he said. Rodriguez received an ovation for about 30 seconds. Reggie Jackson accompanied his mom onto the field, and his daughters were escorted by former closer Mariano Rivera, who drew louder cheers than A-Rod. Yankees co-owner Jenny Steinbrenner Swindal presented a base signed by the team and controlling owner Hal Steinbrenner gave a framed No. 13 jersey when the downpour caused the group to hustle off the field. No farewell tour for A-Rod. The Yankees were letting him go in the middle of a season after one final home game. After sitting on the bench unused for much of the past month, Rodriguez was in the lineup as the designated hitter and batting third for his 2,784th and perhaps final regular-season game as a major league player in a career that started with Seattle in 1994, moved on to Texas in 2001 and then New York three years later. The Yankees distributed accolades from Core Four teammates Derek Jeter, Rivera, Andy Pettitte and Jorge Posada, plus Robinson Cano and former manager Joe Torre. But the festivities seemed as much an exile as a celebration. Admitting to plenty of errors in a life that has included a drug suspension, a World Series title, a divorce, celebrity girlfriends, high-stakes poker games and what seemed to be as many photos on tabloid fronts as backs, he leaves without establishing his own era. He was a supporting actor in the Jeter-Rivera epoch, and when the stars left the cast he could not carry the show. Rodriguez has 696 home runs, fourth on the career list behind Barry Bonds (762), Hank Aaron (755) and Babe Ruth (714). But A-Rod is hitting .203 with nine home runs this year, and with the Yankees deciding last month to trade veterans and turn toward youth, there was no place on the field for ol' Rodriguez, baseball's last remaining player who experienced a work stoppage. Steinbrenner told him on Aug. 3 the end was at hand, and Rodriguez said last Sunday he had accepted an offer to play one final home game and then become a team adviser through 2017, tasked with mentoring young players. "I can't think of anyone else where this has kind of happened, where you've announced on a Sunday that a guy was going to be released on Friday," Yankees manager Joe Girardi said. Rodriguez's locker still had two photographs of himself with daughters Natasha and Ella and three more of the siblings together. There were six pair of baseball shoes, three black gloves and two caps, one for batting practice and the other for the game. But that stall was hours from being vacated. He entered in a 4-for-47 funk and started for just the third time in 19 games since July 22. His skills clearly had diminished; since turning 40 on July 27 last year, Rodriguez was hitting .203 (86 for 424) with 19 homers and 47 RBIs. Girardi refused to play him in all three games at Fenway Park, his final road trip, and A-Rod admitted his relationship with the manager had been "awkward and difficult" of late. Girardi turned down Rodriguez's request to play third base in his finale. Yet, Rodriguez said he didn't feel the Yankees were giving him the brush off. "With all my screw-ups and how badly I acted, the fact that I'm walking out the door, Hal wants me as part of the family, that's hitting 800 home runs for me," Rodriguez said. New York will owe him $7,103,825 for the rest of this year and $20 million for next, the final season of his $275 million, 10-year contract. Having seen his lights go down on Broadway, is Miami 2017 in his future? He has not said he is retiring. "I'm going to need a long nap and recover and I want to see where life takes me," he said, "but right now I think I value wearing this uniform, and for me the Yankees pinstripes is enough." Rodriguez made his debut at Fenway Park on July 8, 1994, at 18 the youngest position player to start a big league game since 1978. A-Rod began his final night with .295 batting average, 3,114 hits and his 2,085 RBIs, second to Aaron's 2,297 since RBIs became an official statistic. "I may have a couple cocktails tonight, so I may not wake up by game time tomorrow," he said.